If there's one thing lacking in much of the world today, it is STABILITY. People desire it... but not all are willing to pay the price to create the kind of environment that benefits every person, home, business, etc… a “stable” environment. When I was a boy, we lived out in a rural, farming area of central Florida. We were not what you would call a farming family, but we were surrounded by; and many of my friends lived and worked on farms. Back then, my brother had an interest in horses; and I remember fencing our acreage in so he and his wife could raise their own horses, as well as board them for others. There were small horse farms to both sides of us. And it was easy to notice the rocks and piles of manure scattered in the fields. Not ours. Though only 5 acres, our pasture was green, lush and rock-free! How did we get so fortunate to have such a nice plat of land? Well, for starters, we walked the field for what seemed to be an eternity to a 12 year old, and picked up every rock we could find. Secondly, about once a month I would "drag" a contraption made of beams and chains behind a tractor, to spread the manure around the field. 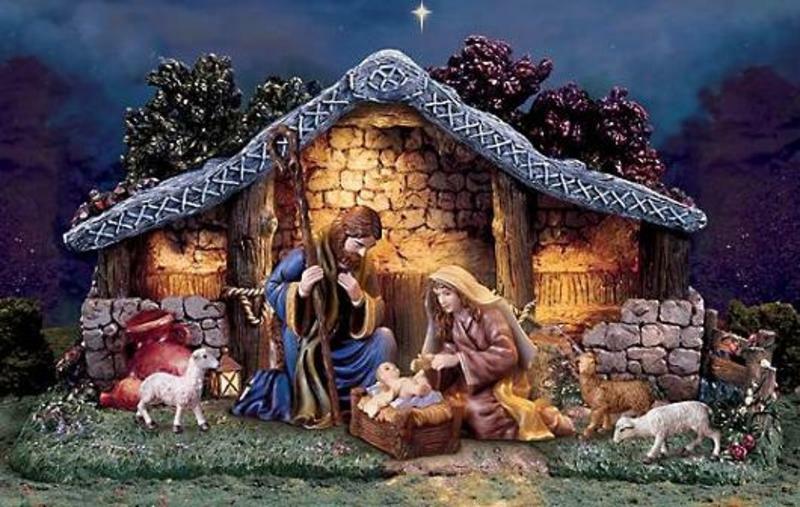 Is Jesus in your manger scene? It’s common to look at your surroundings and see things that are fitting for a barn. The noise, the “manure,” and the burden of responsibilities can often be discouraging. Our hope is to find Jesus in the midst of it all; but we’ll never find Him as long as our main focus is on circumstances. Don’t look so hard on your problems, that overlook the solution. Others are attracted to a “stable” life. No one wants to spend all their time with those who are always down in the mouth. You know them; they’re happy one minute and miserable the next. Few are the RSVPs that are returned for an invitation that reads: “Gloom, despair, and agony on me... You’re all invited to share my misery!” Is there a star shining above your life? Does your stability allow others to find Christ there? The world can always use a little “good news”. Bad news can be found with little effort; but, nothing compares to the love, joy, peace and hope I have in Jesus Christ as a topic for conversation. If others are not talking about the awesome things God has done in your life, today could be the day to change that... if you’ll let him into your manger scene. The life lesson here: If the grass looks greener on the other side, it’s because someone paid the price, and by working in the manure to get it that way. Jesus already paid the price so you can have abundant life! Why would you settle for anything less? I pray this Christmas is the greatest you have ever experienced. Keep Pressing Through!